The statement made by Armenian Prime Minister Nikol Pashinyan that over the past three days the Armenian Armed Forces allegedly killed three Azerbaijani soldiers is false, the Azerbaijani Defense Ministry told Trend Sept. 17. Pashinyan made this statement during his speech at the pre-election rally of the "My step" bloc on September 16 in Yerevan. “In Armenia, covered by chaos, the military leadership, as usual, having deceived the prime minister, provided him with false information,” the ministry said. "In turn, the prime minister with great enthusiasm conveyed this false information to the people, trying in such a way to distract people from his unsuccessful policy." 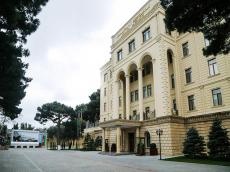 “The Azerbaijani Armed Forces suffered no losses and the situation on the front line is fully controlled,” the ministry said.